Celebrate Earth Day with our best tricks for Green RVing! From big changes like installing solar panels, to minor day-to-day efforts, every RVer can contribute to environmental conservation. Control the air pollution and cost of constantly running your generator by installing solar panels on the roof of your motorhome or towable RV. This is a particularly useful options for RV travelers who boondock, or spend time off the grid where you rely heavily on your generator for temperature control and appliances. Not only will solar panels save you money, they’ll also reduce the harmful emissions caused by your running your generator fairly consistently. Solar panels allow you to camp in unique, remote areas, spend time at family and friends’ residences without needing to plug-in, and even keep your batteries charging while you’re on the road! Going solar can be a significant upfront investment, and is a very personal decision for every traveler. Depending on your rig and lifestyle, however, solar panels often pay off in no time! Whether you camp in remote locations or resort-style campgrounds, the easiest way to contribute to environmental conservation is to follow the common hiker’s motto: Leave Nothing But Footprints! That is, be sure to pick up all trash before you head out from your campsite, only burn organic materials in fire pits to limit the toxins released, and use marked campsites so as not to damage the natural landscape you’re enjoying. Also be sure to know and follow the current fire rules at your location to prevent catastrophic incidents like forest fires. Planning dinner? Consider shopping at a local store or farmer’s market to gather your ingredients. This great practice has a ton of immediate benefits! Attending a local event enriches your travel experience by giving you an insider look at your current location. Moreover, your dollars spent will support local farmers and businesses. Lastly, buying local produce minimizes the carbon footprint of your purchase, as your delicious fruits and veggies don’t have to travel far from farm to your campground cuisine! Most green initiatives that make sense for a traditional home translate easily to your life on the road. Re-use dishes instead of utilizing wasteful paper and plastic-ware, swap classic bulbs for LED lights to conserve energy, and limit yourself to quick, water-conscious showers. At the end of the day, RVing can be a surprisingly green activity! According to GoRVing.com, RV owners report limited water use and an increased focus on recycling while traveling. Even further, due to the limited space in an RV, it takes less energy to heat, cool and maintain a home-on-wheels in comparison to a sticks-and-bricks residence. 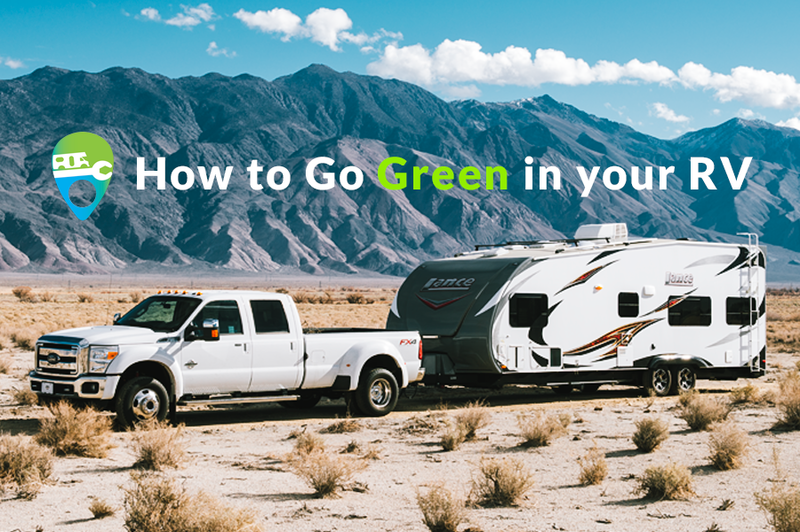 Taking on a few additional green initiatives can truly maximize your eco-friendly life on the road, ultimately protecting the gorgeous natural landscapes RVers seek every single day! Have a conservation or recycling tip of your own? Share in the comments below!